On May 25, 2009, High-Voltage Software announced they were working on Gladiator A.D., a game exclusively for the Wii. 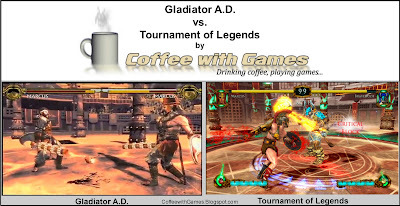 On February 3, 2010, it was announced that Gladiator A.D. wasn't the same anymore, it is now Tournament of Legends. I wasn't initially sure if Tournament of Legends was the same as Gladiator A.D., because of the character models and there was more color in the screenshots. 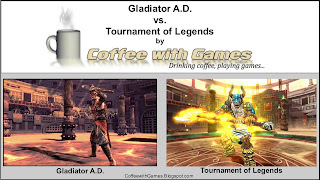 It has been confirmed though, Gladiator A.D. has been changed to Tournament of Legends. High Voltage Software and Sega still haven't released any video footage of Tournament of Legends, but I noticed a few things about Tournament of Legends from the few screenshots they have released. It appears they are using some of the same levels from Gladiator A.D. in Tournament of Legends. The level names below are how they appeared in Gladiator A.D. I'm listing some differences I've noticed between each games' levels, and including the screenshots as well. a) It now looks like the fighters will fight surrounded by a pit of some sort. I can't tell if the pit opens and closes as an interactive part of the arena or not. Previously, in Gladiator A.D. pictures and videos, the only "pits" were what looked like pits where lions would possibly come from. b) Also in Tournament of Legends' photos, it looks like there are arrows in the ground and what I think appears to be some sort of tentacles randomly around the level. c) The flags around the Colosseum in ToL are noticeably more colorful than they were in Gladiator A.D. Tournament of Legends is a more colorful game in general now. d) The spiked columns around the Colosseum in Tournament of Legends appear to have some sort of a fire/flame coming off the top of them, whereas in Gladiator A.D., I didn't spot that effect. The spiked columns in ToL also appear to have a lime-green neon glow on them in certain areas, this was not present on the spiked columns in Gladiator A.D.
e) Tournament of Legends is lacking crowds in the Colosseum, whereas Gladiator A.D. had crowds of people scattered around the Colosseum cheering/booing depending on what was happening. a) Tournament of Legends' level takes place at night, Gladiator A.D.'s level took place at dusk. b) Gladiator A.D.'s level had water in the middle arena area, and the fighters were standing in the water the entire fight. In the Tournament of Legends picture, it doesn't look like the fighters will be fighting while standing in the water. The middle arena in Tournament of Legends does appear as it's been raised slightly. I'm wondering if the environments are more interactive in Tournament of Legends and perhaps there's a switch or something to cause the water to rise during the middle of the fight? c) The plants and vines around the Gardens' arena are noticeably greener in ToL, and the water is noticeably more blue in ToL. ToL retained the cascading water streams on the outside of the arena that Gladiator A.D. had originally, which I like. d) Same as the Grand Colosseum, ToL's level for the Gardens doesn't have any audience/crowd standing around the arena watching the fight. In these pictures above, the level shown was known as the Grand Colosseum in Gladiator A.D. You can see the Gladiator A.D. image on the left, and Tournament of Legends on the right. If you click the image to enlarge it, you can notice the fire(?) effect on the top of the spiked columns in the Tournament of Legends photo(photo on right). If you look at the decorative banner, near the top right corner of Gladiator A.D.'s picture, then look at in the Tournament of Legends picture, you will notice more color and the symbol has changed on it from Gladiator A.D. to Tournament of Legends. In this image, the level shown was known as the Gardens in Gladiator A.D., I'm not sure if the level name has changed for Tournament of Legends. In the Gladiator A.D. image on the far left, you can see what appears to be the sun setting(rising?) in the level. In the Tournament of Legends image on the right, you can notice the moon(?) in the background and also how the plants on the pedestals are greener than they appear in the older Gladiator A.D. images on the left. Also, the crowd is lacking from the Tournament of Legends image, but present in the Gladiator A.D. images. In these images, look at the spiked columns in Gladiator A.D., then look at the spiked columns in Tournament of Legends. The spiked columns in Tournament of Legends appear as though they have sort of neon lime-green lighting on them? Also, these images show how the HUD(head-up display) differs from the version then and now. In Gladiator A.D., all the meters were at the top. Now in Tournament of Legends, there is a meter at the bottom of the screen. I wonder if the HUD will be customizable in the game, like it was in The Conduit. I was really impressed with what I saw coming from Gladiator A.D. and what it seemed that High Voltage was trying to achieve with it. I'm not as impressed with what I've seen from Tournament of Legends(although it's only been screenshots). I liked how HVS was trying to allow the player to win favor with the crowds in Gladiator A.D., and after winning the crowds favor, the player could, "...challenge the champions for fame, wealth, and in some cases, freedom...". Eric Nofsinger(HVS) told Matt Casamassina of IGN.com, "The Wii MotionPlus will be used to add variance to the attacks to break up what could possibly be seen as mechanical attacks. For example, depending on the orientation of the player's wrist when a left slice is initiated, the gladiator will attack his opponents right side from one of three angles, making it slightly more difficult to perfect block...". I thought this would make Gladiator A.D. a very strategic fighting game when WM+ was used, and I thought that would help set it apart. It's been confirmed that Tournament of Legends will not use WM+. If you've known about Tournament of Legends, when it was known as Gladiator A.D., what do you think of the changes to the game? Are you more excited about Tournament of Legends new style, or did you prefer the style of Gladiator A.D.? Is there anything you wish Tournament of Legends had kept from the original version of Gladiator A.D.? 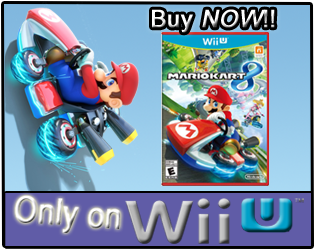 Tournament of Legends is releasing on the Wii on May 18, 2010, do you plan on buying the game from what you've seen of it, and what you know about it? I'd love to know what you think, good or bad! Also, I'm debating on using a "Jump Break" for some posts, this was one of them. Do you prefer the posts to appear entirely on the main page, like they have been, or would you prefer a "Jump Break" for the longer posts? Why are Sega making two games that are too similar. If one of them doesn't sell well the other probably won't either. Seems rather stupid. Tournament of Legends is what Gladiator AD was so its now a new game altogether. Don't like the new look it was darker and edgier before. Probably wont be as violent and if theres no motion plus support it will be a failure. As the other two stated, Tournament of Legends is Gladiator A.D., though I really wonder if HVS isn't keeping the characters and idea of Gladiator A.D. for the other consoles. Thanks for the quick reply to the first post! Gladiator A.D. was getting a "Mature" rating from the videos I saw of it. It looks like the blood and violence have really been toned down in Tournament of Legends, and the game should end up with a "Teen" rating. Thanks to you three for the comments! There's no motion plus, no online, no blood anymore, and the gameplay is just like Punch-Out, you can't move around the arena. I'm betting this will be a failure. I hope someone HVS is reading these posts. It's a big mistake adding all this color to the game. 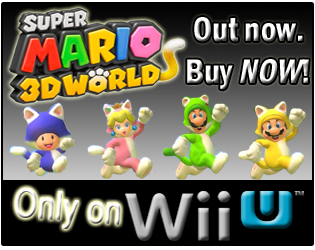 It really makes it look childish and loses the realistic gritti feel that it had before. I think you'll be able to move around the arena areas, like what was shown in Gladiator A.D. I don't think it's like Punch-Out with just a left/right/dodge movement. I'm going to forward them the comments, so they can at least read what the gaming community is thinking. It's kind of easy to confuse Tournament of Legends with Rage of the Gladiator, now that they look very similar. Both games are now taking a more mythological approach, with magic attacks and the characters based off mythological characters. I really think that Rage of the Gladiator would greatly compliment Tournament of Legends at retail, especially considering Rage of the Gladiator uses WM+. If I was the leading-artist of HVS, I would be very disappointed because of the graphics. Gladiator A.D. would be much better, the public was very excited about that, and probably, Gladiator A.D. was the best option instead of Tournament of Legends. It's a shame to announce a game and give up after a lot of people become fans.